Attacks and destroys foreign scent molecules with ozone (03), leafing your gear odorless. 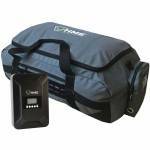 Includes Ozone order eliminator Eliminates odor on clothing & gear Kills bacteria, and virus and is 100% chemical-free, leaving no scent or residue Variable cycle setting 1-40 minutes active ozone cycle 40-360 minute resting cycle Ozone output 250mg/h AC & Car adapter included Large Duffle for high capacity odor elimination. Wide full top opening for easy access Side zipper pouch .. Rotating Clip, fits most cellphones. Mossy Oak Break-up Infinity .. The Big Bear is our most modular pack yet - it can be used as a fanny pack, day pack, or both! The fanny pack has a large extendable day pack that expands out of the fanny pack to give you an additional 1,900 cubic inches of space. If you're going on a short trek and only need the capacity of the fanny pack, the expandable day pack section can stow away. You can also connect optional pockets to the front of the shoulder harness. 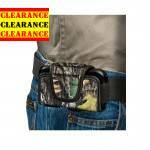 There is a binocular pocket or turkey call pocket that can clip ont.. The Pursuit Bow Pack is perfect for keeping your bow secure and stowed away when you're trekking through the fields and rugged terrain. The lashing straps, along with the expandable bow pocket, make a great combination to securely keep your bow in place. Having a pack that will hold your bow is nice so you can keep your hands free. 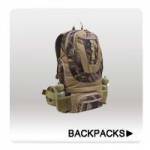 There is a large main pocket, large front pocket, and lower side mesh pockets to keep your gear organized. The waist belt is padded so when you're carrying a little b..